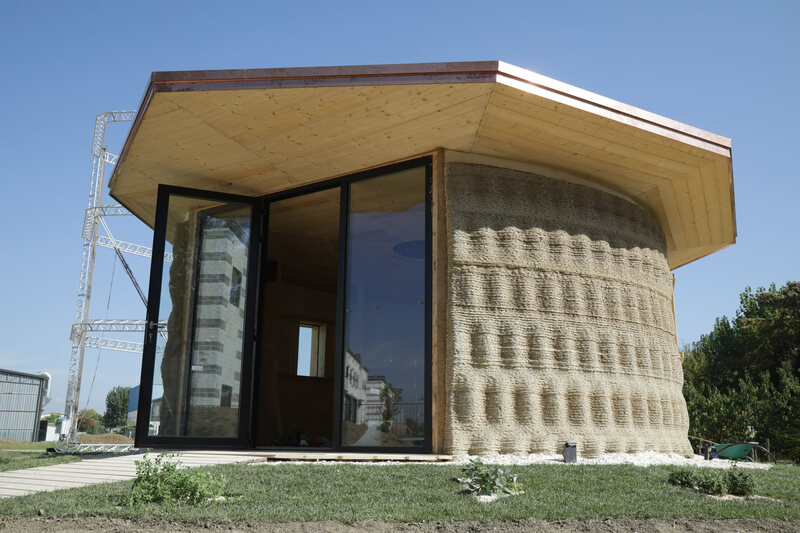 On the occasion of the “Viaggio a Shamballa” event and the “A call to save the world” conference, WASP presents Gaia, a case study of 3D printed house using the new Crane WASP technology with natural materials from the surrounding area. The Italian company’s commitment, since its origins in 2012, has been constantly aimed to the development of equipment for additive manufacturing on an architectural scale and the inauguration of Gaia represents an important milestone, also in light of all the researches conducted in the 3d printing field, in the design and materials study, researches that, in 2015, have allowed the realization of the 12 meters BigDelta WASP 12MT. Gaia, a new eco-sustainable house model designed and built using the 3D printer called Crane WASP. Gaia, whose name is due to the use of raw soil as the main binder of the constituent mixture, can be considered a new eco-sustainable architectural model with particular attention to the use of natural waste materials, coming from the rice production chain and oriented to the construction of particularly efficient masonry from a bioclimatic and healthy point of view. This research was also possible thanks to the collaboration with RiceHouse. Gaia is a highly performing module both in terms of energy and indoor health, with an almost zero environmental impact. Printed in a few weeks thanks to its masonry, it does not need heating or an air conditioning system, as it maintains a mild and comfortable temperature inside both in winter and in summer. For the realization of Gaia, RiceHouse supplied the vegetable fibers through which WASP has developed a compound composed of 25% of soil taken from the site (30% clay, 40% silt and 30% sand), 40% from straw chopped rice, 25% rice husk and 10% hydraulic lime. The mixture has been mixed through the use of a wet pan mill, able to make the mixture homogeneous and workable. The bioclimatic project by RiceHouse takes advantages of the passive contribution of the sun thanks to its South West orientation where a large window is positioned to optimize natural light, but in particular is centered in the stratigraphy both in the roof, made of wood with an insulation in lime+chaff (RH300), both in the lime+chaff screed, light but thermal that allow to reach an energy requirement equal to a class A4. The monolithic wall printed in 3D was then finished internally with a shaving clay-lamina (RH400), smoothed and oiled with linseed oils. The external casing, completely 3D printed on-site through the Crane WASP, has been designed with the aim of integrating natural ventilation systems and thermo-acoustic insulation systems in only one solution. The deposition of the material based on raw earth, straw and rice husk is controlled through articulated weaves able to confer at the same time constructive solidity and geometric variation along the entire wall development. The versatility of the computational design is in fact made possible in the construction practice thanks to the precision and speed of the 3D technology, obtaining complex geometries, difficult to replicate with the traditional construction systems. It took 10 days for the realization of the 3d printed casing, for a total of 30 square meters of wall whose thickness is 40 cm and the total cost of the materials used in the wall structure is € 900. On the basis of the data experimented with Gaia, it is possible to concretely conceive new economic scenarios in which one hectare of cultivated paddy field can become 100 square meters of built area. Gaia experience offers the opportunity to divulge the multiple potential that 3D printing can express thanks to the world agricultural resources, guaranteeing a minimum environmental impact in addition to infinite design solutions, essential in a new living frontier vision. GAIA is the result of our 7 years of research in the field of 3D printing and architecture, we strongly wanted this architectural module to demonstrate which is the current potential of 3D printing in the architectural field, with its advantages and its limitations, and has an immersive experience for our guests. WHAT DOES GAIA CONSIST OF? GAIA was built with an evolution of traditional raw earth construction techniques. Great importance in this type of construction is given to the foundation, fundamental to avoid dangerous infiltration of water from the ground and to avoid breakage due to differential ground subsidence. In our case the foundation is made up of parts molded in cement mortar and reinforced concrete castings that also serve for the joint of the structure. The masonry in raw earth rests on a concrete slab and contains inside: the system of systems, the thermal insulation system and the external wall ventilation system. The glulam roof is supported by a pillar structure also made of laminated wood, embedded in the foundation, this guarantees the usability of the spaces in total safety. WHICH PERFORMANCES AND WHICH COMFORT DOES THE HOUSE PROVIDE? The thermal performance exceeded the design expectations, and proved to be very satisfactory. The average thermal transmittance of the molded masonry of the module is 0.249 W / m2K and makes possible, thanks to the excellent performance of the floor and roof elements, the cataloging of Gaia in energy class A4. We are also monitoring internal environmental parameters to get a real feedback on the calculated values. HOW MUCH RESISTANT IS TO ATMOSPHERIC AGENTS? The GAIA architectural module has a physical protection against atmospheric agents, the wide covering guarantees a good protection against thunderstorms. The material used does not have any type of chemical protection that would alter its composition, nevertheless, there were no problems of washing out erosion. HOW MUCH RESISTANT IS TO NATURAL DISASTERS? GAIA was designed to be built in Massa Lombarda (RA) Italy and therefore complies with all current construction standards. The printed portion is loaded only by its own weight and appears as an external padding to the lamellar wood structure which supports the roof. Although our intent is to build entirely printed buildings, at the moment our technology does not allow us to provide the molded portions with a resistance and such resistance as to allow them to be used structurally in areas deemed to be at risk from earthquakes. WHICH THE ADVANTAGES OF 3D PRINTING WITH EARTH AND STRAW? Advanced material: mixing earth, straw and rice husk, it is possible to obtain a composite and fiber-reinforced material suitable for 3D printing. The presence of vegetable fibers limits shrinkage during drying and significantly reduces the fragility of the earth material. Low impact material: the energy needed to transform the soil into 3D printing material is very little, but even less is that necessary for its disposal, in fact unless building is not maintained, it will soon be ground again. Speed ​​of construction: 2 men can build an enclosure that protects 20 square meters of floor space in 10 days. High Tech / Low Tech: new life to traditional techniques, in our case an ancient material such as raw earth combined with straw becomes with 3D printing a highly performing and workable material, like the most advanced building materials. Dissemination of knowledge: thanks to 3D printing, architectural projects can become processes capable of adapting to different contexts, this would increase the possibility of sharing knowledge connected to building on a global scale. Curative walls: we are developing a system of diffusion of essential oils inside the walls of the building to repel mosquitoes and parasites without using harmful substances. This system would guarantee the use of repellents without having direct contact with building users. Reuse of materials: all our projects are born to be placed in a circular economic model, for this reason waste materials such as soil, waste from the agri-food chain and rubble can be used for new constructions. Using our mixture of raw earth and straw it is possible to extrude at a speed of 4200 mm / min with a maximum feed in height of 300 mm in 24 h to allow the drying of the material. This allowed us to print a wall consisting of 7 layers of 2.70 m high in 100 hours for a total of 22 km of car route. By simplifying the geometry, it is possible to reduce printing times to reach the desired height, but this does not coincide with our desire to obtain high performance walls. If you intend to use cement-based mixtures or that in any case by means of a chemical reaction they have a rapid change in state (from liquid to solid), it is possible to increase the progress in height reaching a limit of 150 mm / h. The speed of movement of the printer is instead related to the fluidity of the material, with well-calibrated materials it is possible to reach 6000 mm / min. CAN ON-SITE MATERIALS BE USED? GAIA is a unique case in the world, because it is tangible evidence that the principles of the circular economy can be applied in the construction and 3D technology sector. Gaia is the result of a limited and optimized use of agricultural resources, which through technology have been converted into a complex building envelope with minimal environmental impact. We also believe it is possible to develop materials suitable for extrusion using mixtures of materials found on sites different from ours, without neglecting the possibility of using debris and rubble of pre-existing buildings properly shredded and mixed with new binders. GAIA COULD BE PRINTED WITH CONCRETE? GAIA is an architectural module derived from the desire of showing the full potential of our technology capable of using materials at zero Km, however it would be possible to realize the same concrete wall, but losing all the benefits of a construction in natural materials. WHICH KIND OF BUILDING CAN I PRINT? The shape of GAIA was born from the aim of obtaining the largest surface area possible with a single printer unit, the circular plan therefore allows to maximize the walkable area and reduce the wall surface. However, it is possible to print buildings with any imprint on the ground, in addition the Crane WASP is made to meet any size requirement. You can also print multi-storey buildings by editing the Crane WASP during printing, as long as the material used for printing allows it. 800 kg of rice husk, 150 kg of rice straw, 11000 kg of ground soil and 800 kg of natural hydraulic lime. The masonry has a maximum height of 2.70 m for a total area of ​​30 square meters and a thickness that varies from 45 to 35 cm. The Crane WASP has a steady-state absorption of 1.1 Kw / h, while the pumping system has a steady-state absorption of 2.0 Kw / h. 290 Kw of electricity were used to complete the masonry of GAIA. The entire printing phase of 100 hours was followed by a person in charge of the preparation of the material and one in the 3D printing control, for a total of 200 hours of manpower. GAIA is an architectural project that includes multiple processes. WASP has currently carried out research aimed at developing innovative systems for masonry and foundations. HOW MUCH DOES IT COST, ESPECIALLY IF COMPARED TO A TRADITIONAL HOUSE? The evaluation of construction costs, comparing the 3D printed buildings with the ordinary ones, is not right because it does not make customers aware of the technological value of the former. It is instead appropriate to compare the opportunities offered by 3D technology in terms of constructive efficiency, spatial articulation and energy performance. WHICH ARE THE NEXT STRATEGIES IN THE CONSTRUCTION FIELD? Currently the company intends to evaluate the critical issues of the system and to bring the level of process automation to a higher level. The next step will be to approach the building world as a supplier of on-site 3D printing services. In a couple of years, when the whole system will reach a high degree of reliability, we will proceed with the sale of all the equipment necessary for printing. WHAT SHOULD YOU EXPECT FROM THE FUTURE? The interest and development of buildings through 3D printing is growing exponentially, however it is still difficult to imagine a real market spread in the upcoming years. WASP will be the protagonist in the evolution of this technology, offering new construction perspectives and new models of living. Me gustaria poder hacer una casa de estas en el futuro . En spain, Bizkaia (cerca de Bilbao ) . Me gustaria tener el contacto y las posibilidades. Thanks a lot for your interest and for your appreciation. We invite you to send an email to [email protected] to get further information. Keep in touch.